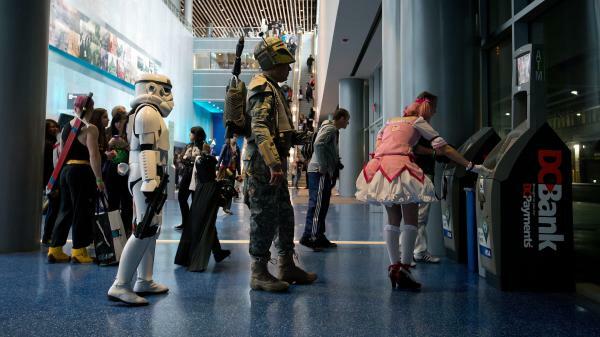 Anna Swope, dressed as a stormtrooper from Star Wars, and her husband Stephen Goss, dressed as the films' Boba Fett, wait to use an ATM while attending the Fan Expo convention in Vancouver, B.C. Tompkins now runs the Houston Zombie Walk, a charity walk that he promotes in a booth at Comicpalooza, Houston's leading comic con. He's watched attendance here nearly triple over the past two years, from 11,000 to more than 32,000. And while there are people in costume, most attendees are ordinary folks in street clothes. 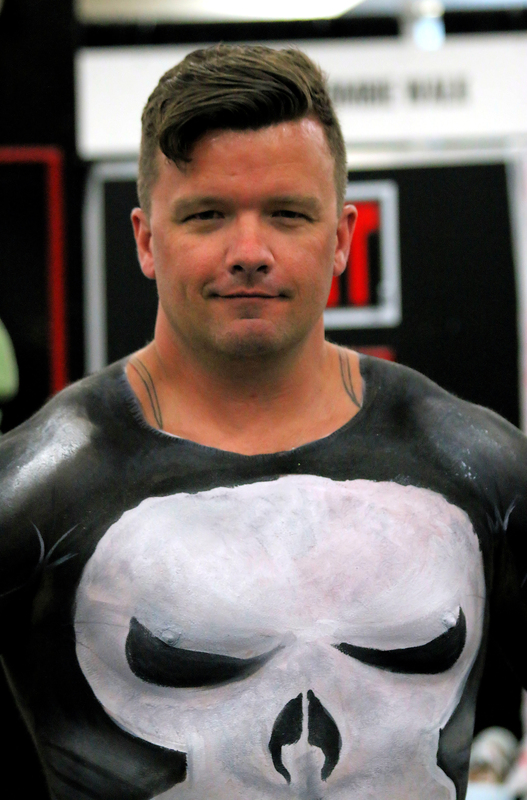 Darren Tompkins, founder and president of the Houston Zombie Walk and dressed as Marvel Comics character The Punisher at Comicpalooza 2014 in Houston, says cons used to be "just a place for comic book dealers to get together and sell their wares." "This is a vastly growing market," says John Simons, Comicpalooza's founder and chairman. "And a lot of that is tied to the fact that a lot of the things that were previously considered, you know, geeky or nerdy are now very mainstream; everybody goes to see Spider-Man." Superhero movies are a big part of the growing popularity of comic cons. Such movies used to come out once every few years. In 1989, Batman earned just over $400 million in ticket sales. The first Spider-Man film, in 2002, doubled Batman's record. Now, Hollywood turns out at least one superhero movie a year, and they rake in billions at the box office. The growing popularity of comic cons is why a European multinational bought Toronto-based Fan Expo, the company behind one of North America's largest comic cons. Fan Expo president Steve Menzie says his mandate is to buy up other conventions. His first purchase: Dallas Comic Con, the largest event in Texas. "So the way we wanted to approach it was to find like-minded show promoters like ourselves that had produced great events ... that we could kind of bring under our tent, enable them to sort of continue doing what they do, but to facilitate doing that bigger, better, and hopefully more of," Menzie says. But as the industry shifts toward big corporate players — who can afford big venues and pay for big-name guests — there's more pressure on smaller, independent organizers like Christina Angel, director of Denver Comic Con. "When you get a group of corporate franchise cons that have much deeper pocket books, it's difficult to compete with them," Angel says. "They can get bigger guests, and we depend entirely on our attendance numbers to be able to attract guests of a certain level to our shows." That means putting on the best show they can, which is what Comicpalooza was aiming to do when it brought comic book legend Stan Lee to Houston. "It used to be just for kids. Now, people of every age are here," Lee says. "I meet people who come with their children. I meet people who come with their grandchildren. You see older men with beards. It encompasses the whole human race!" And with that, Lee turned and climbed onto the stage to face more than 2,000 screaming fans. Dozens of Comic-Cons will happen over the next few weeks. These are those big conventions for comic book and sci-fi fans. The biggest Comic-Con of them all is later this month - San Diego's Comic-Con International. Reporter Andrew Schneider of Houston Public Media reports on how a niche market is turning into a multinational industry. ANDREW SCHNEIDER, BYLINE: Darren Tompkins attended his first Comic-Con in Roanoke, Virginia, back in the mid 1980s. At the time, these gatherings were for diehard comic fans, people who might invest in a Batman or Joker costume to wear once a year. DARREN TOMPKINS: And really it was just a small ballroom filled with cardboard boxes. I mean, there weren't any actors or famous people or panels or anything. It was just a place for comic book dealers to get together and sell their wares. SCHNEIDER: Tompkins now runs the Houston Zombie Walk, a charity walk that he promotes in a booth at Comicpalooza - that's Houston's leading comic-con. He's watched attendance here nearly triple over the past two years, from 11,000 to nearly 32,000. And while there are people in costume, most are ordinary folks in street clothes. JOHN SIMONS: This is a vastly growing market. SCHNEIDER: John Simons is Comicpalooza's founder and chairman. SIMONS: A lot of that is tied to the fact that a lot of the things that were previously considered, you know, geeky or nerdy are now very mainstream. You know, everybody goes to see "Spider-Man." WILLEM DAFOE: (As Norman Osborne/Green Goblin) You've spun your last web Spider-Man. SCHNEIDER: Superhero movies are a big part of the growing popularity of comic cons. Such movies used to come out once every few years. In 1989, "Batman" earned just over $400 million in ticket sales. The first "Spider-Man" film in 2002 doubled Batman's record. Now, Hollywood turns out at least one superhero movie a year and they rake in billions at the box office. UNIDENTIFIED MAN: Oh my goodness - at Fan Expo with the cast of "Orphan Black." SCHNEIDER: The growing popularity of comic-cons is why European multinational bought Toronto-based Fan Expo. The company behind one of North America's largest comic-cons. Fan Expo President Steve Menzie says his mandate is to buy up other conventions. His first purchase - Dallas Comicon - the largest event in Texas. STEVE MENZIE: The way we wanted to approach it was to find like-minded show promoters like ourselves that have produced great events over the years, enable them to sort of continue doing what they do but to facilitate doing that bigger, better and hopefully more of. SCHNEIDER: But as the industry shifts towards bigger corporate players, there's more pressure on smaller independent organizers like Christina Angel. She's director of Denver Comic-Con. CHRISTINA ANGEL: When you get a group of corporate franchise cons that have much deeper pocketbooks, it's difficult to compete with them and they can get bigger guests and, you know, we depend entirely on our attendance numbers to be able to attract guests. SCHNEIDER: And that means putting on the best show they can. UNIDENTIFIED ANNOUNCER: Mr. Stan Lee. SCHNEIDER: Which is what Comicpalooza was aiming to do when it brought Stan Lee to Houston. Ticketholders lined up for blocks to see the former publisher of Marvel comics and the creator of Spider-Man, Ironman and dozens of other superheroes. STAN LEE: It used to be just for kids. Now people of every age are here. I meet people who come with their grandchildren. It encompasses the whole human race. SCHNEIDER: And with that, Lee turned and climbed onto the stage to face more than 2000 screaming fans. For NPR News, I'm Andrew Schneider in Houston. MCEVERS: You're listening to ALL THINGS CONSIDERED from NPR West. I'm Kelly MCEVERS. Transcript provided by NPR, Copyright NPR.